Love is in the air - and we are filming it! Last year we had a web camera mounted on Hornøya bird cliff giving close up views of the Puffins on the cliff. Thanks to funding from Rob Barrett of Tromsø University Museum, we now have the opportunity to mount another bird cliff web camera. 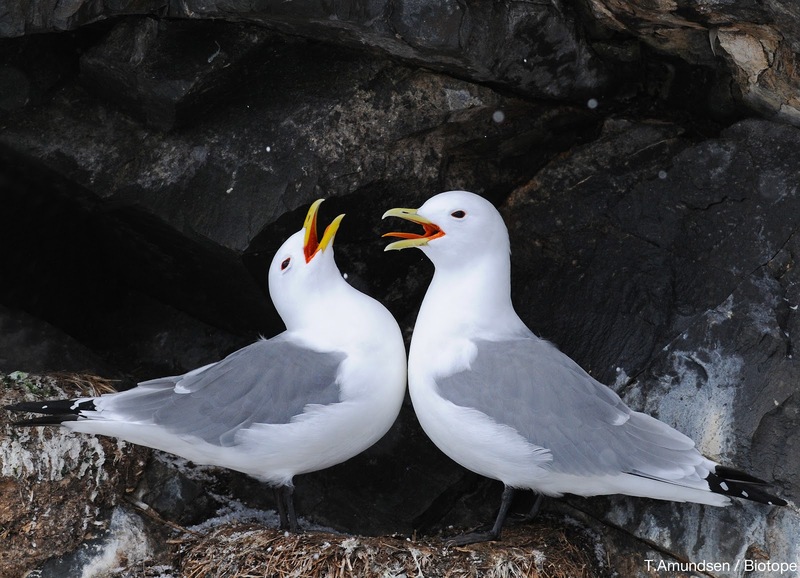 This time we will have a closer look at the life of the Kittiwakes on Hornøya. Hornøya is an amazing place: it is the home of 100 000 seabirds, and it is only a 10 minute boat drive from Vardø island. It hosts a wide varitey of bird seabird species. It is this spectacle we aim to bring closer to the people of Vardø and the rest of the world. This time we have also expanded the project to inlculde high quality microphones, because the sound of the cliff is just as spectacular as the views. Below follows a few images from the trip we just did to the cliff to mount this new web camera, in proper arctic weather. We are just getting into the mode of making a few Iphone video productions: fast and easy. Hopefully you will enjoy getting a glimpse of just another day at the office! The Kittiwakes have just settled in the bird cliff. Our new web camera is fixed at section of the Kittiwake colony. This time with high quality sound too. Hornøya is one of Varangers finest bird sites. 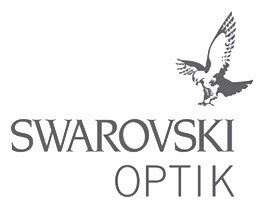 A true spectacle! This photo was taken from the boat to Hornøya. 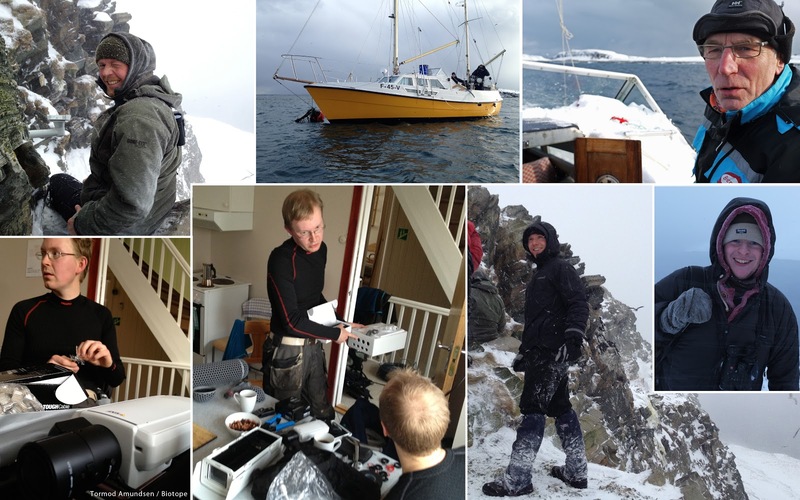 The team at the bird cliff: Eivind Bøhn and Reidar Øksnevad from Cloudware, Tormod Amundsen and Alonza Garbett from the Biotope office and Ole with his very cool sailing / fishing vessel. Arctic style! Hornøya March 10th, 2013. 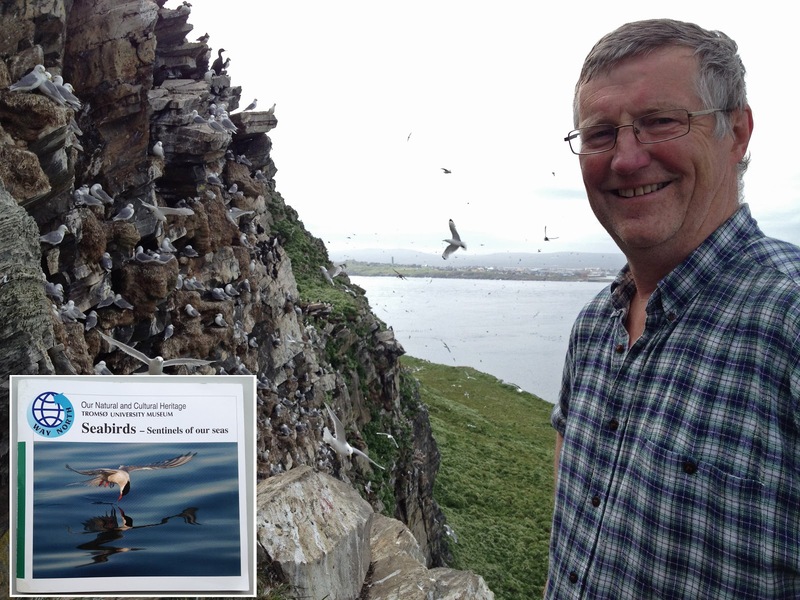 Rob Barrett of Tromsø University Museum (link to booklet) have been researching seabirds on Hornøya bird cliff for more then 30 years! In Vardø he is known as Mr. Hornøya - with good reason. No one has spent more time on this magnificent place then Rob. I can highly recommend checking out the seabird booklet written by him and several of his collegues. 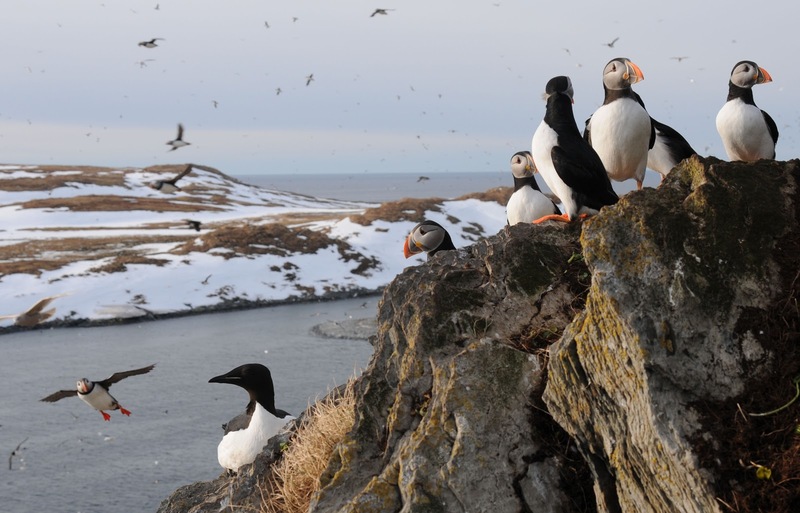 This is everything you need to know about seabirds of the north, and then some. A great publication. 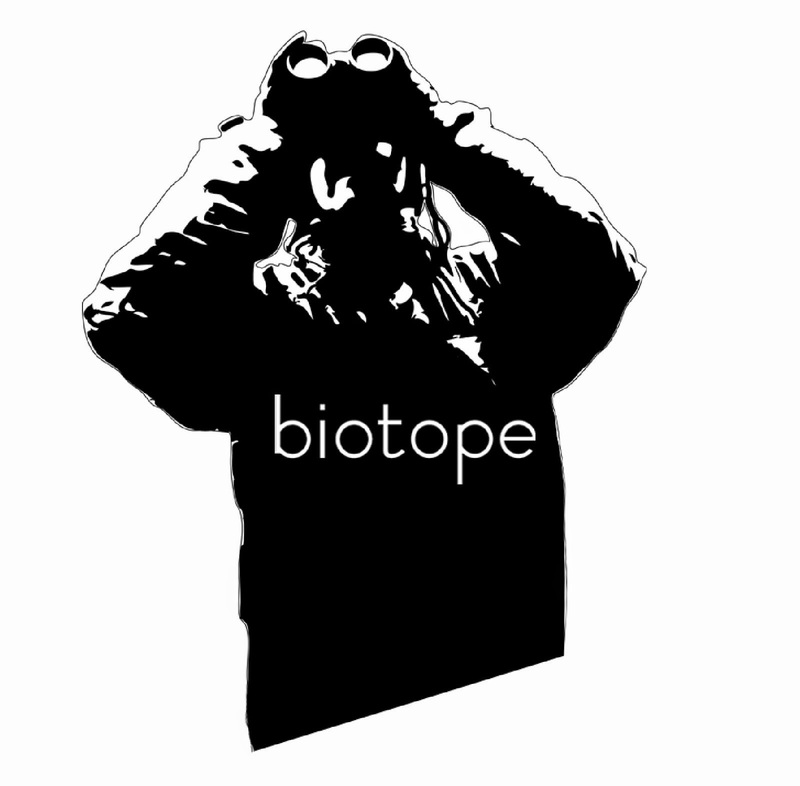 Knowing that this new web camera will let scientists monitor the bird life on Hornøya even closer is great. Rob and Tromsø University Museum have financed all the hardware for this project. This project is both public awareness and science combined! 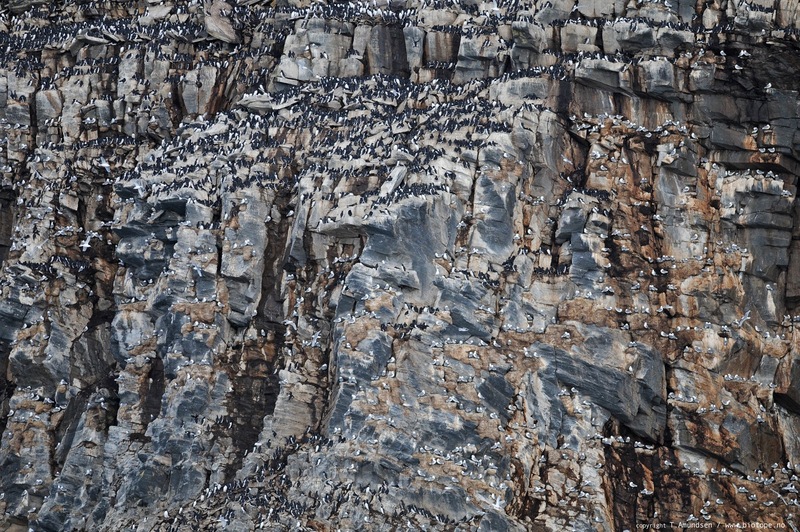 The variety of bird species on Hornøya is great. The high arctic alcid species Brünnichs Guillemot is one of the birds that many visiting birders want to see (sitting left in image). 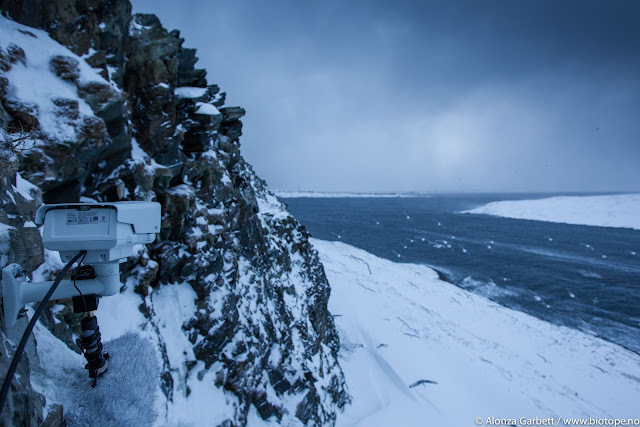 With the amount of birds present on Hornøya Gyrfalcons, Ravens and White-tailed Eagles make a daily drama at cliff. 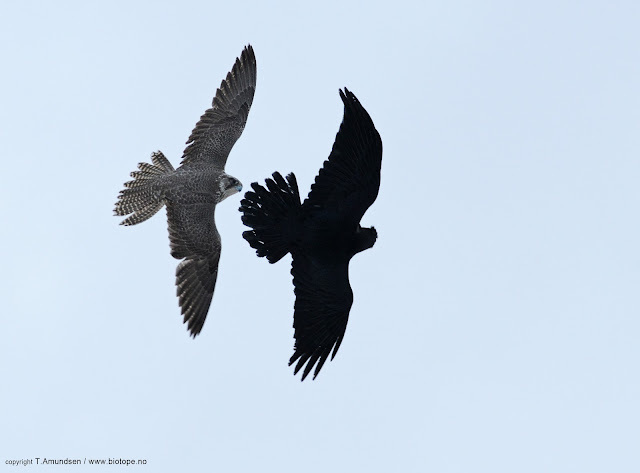 This photo is from the most read article on the Biotope website: Gyrfalcon versus Raven. Cool scenes from a spectacular place. 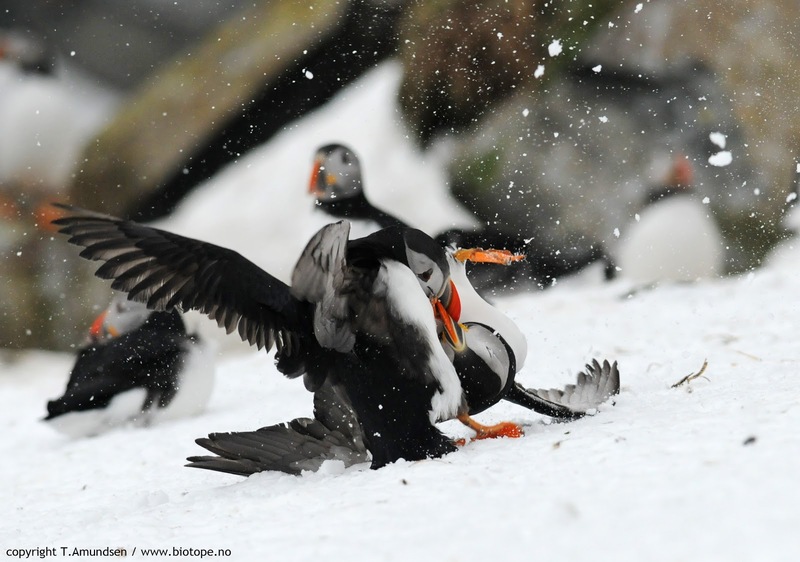 The Puffins may be cute, but they are also fierce fighters! Check more photos in the story about the previous Hornøya web camera, with a Puffin fight club series. 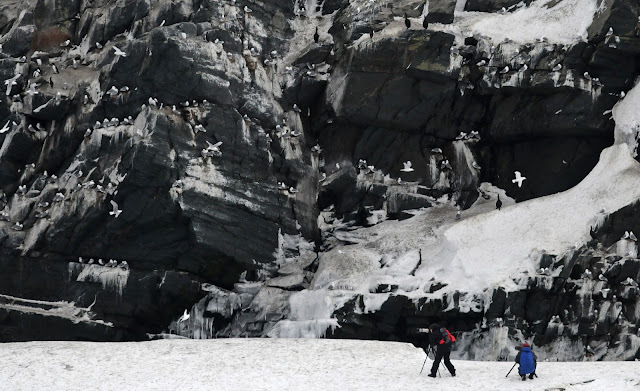 With such wide variety of spectacular birds and stunning landscape Hornøya has become a favourite location to visit for birders and photographers from all over the world. We are very happy to have this place so close to our office! It makes livving in the arctic a greater experience. Now with the new web camera we can share it with the world too. We hope you will enjoy it! We will launch the new Kittiwake web camera on Gullfest 2013, in a weeks time.